Classic: Just the classic paypal button, you can configure it to show the credit card logos or not. Text Box: A paypal button with a textbox so the donators can set the amout they want to donate right away. Three Buttons: Three paypal buttons that you can configure with any quantity that you want. I added two progress indicators!! Hello, just testing your plugin. This is a very cool plugin, nice work! The only thing I see as an issue is the increments don’t seem to be working on my test site, it always increments as 1. Do you plan on adding any other processors beside PayPal? Hello Dave!, thanks a lot for checking the plugin. I didn’t see that issue, i will fix it. Right now there are many things that can be improved on the plugins so i want to focus first on the stuffs that people ask me. You are the first person that ask me a feature (thank you!!) so i guess i will start with that =). Which processor beside PayPal do you want to use? And by the way, the wish list page of the plugin was broken but, if you want, you should be able to use it now. Hi Edgar, thanks for the reply. Well, I would LOVE to see WePay or Stripe integrated as payment options. The slider option on your plugin is Great by the way! Can I pop you a mail sometime? Okay, i will work on adding those. Haha, im glad you like it. The slider is my favorite style. Sure, you can reach me at edseventeen@gmail.com. Thats my personal email. Oh, and a template tag to insert directly into templates would be awesome too! Where I can find shortcode? If I need this plugin show on my page? Hello, thanks for checking the plugin. To add a donation to your post just type [sdonations]donationid[/sdonations] (example:[sdonations]1[/sdonations]). You can find the donation id of your donation on the donations list. I know this method is clumnsy and i plan to improve it later but i hope this is good enough for now. Sure, i have it on my list now =). donation amount where? on wepay? wepay only support US for now. You can change the currency of paypal if you expand the advanced options. I’m a WP/plugin rookie. Trying to install a donation button on my site. I installed the plugin and activated it, then dragged the widget to the “Top Login Area” on the widget page. What goes in the ‘title’ box and the blank dropdown box? How do I connect it to my PayPal account? Hello, the drop down is blank because you don’t have a donation yet. Once you activate the plugin you will see a new option in your admin menu (the place where you activate plugins, create post etc) named “Smart Donations”, click there and then click on “Add New”, there you will be able to create a donation. After that you will see that donation in the drop down. Hope that helps and if it doesn’t please let me know =). First, great widget! Thank you for your good work. 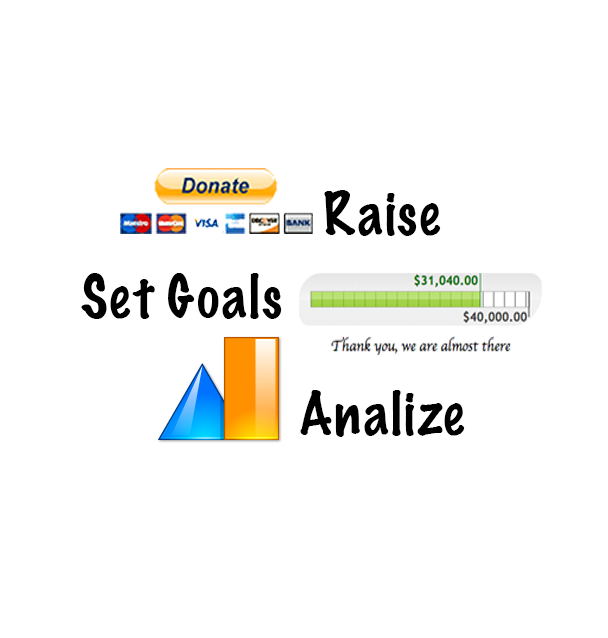 I want to give the user the option to submit a donation based on a predefined list of amounts. The ThreeButtons style works for this but I’d rather list the value and use the standard (classic) button for each one. That is, I don’t want the amount to show in the button. Instead, I created 3 Classic Smart Donations and put them in a table with the first column showing the amount. I can’t find a way to assign an amount to a Classic Button. Is it possible? Hello! !, Good observation, i never though on that. Unfortunately that is not possible at this time, at least not easily. I will try to add this on the next release =). Hello. Great plug in. i can not figure out how to get the money from a donation. Thanks. I have wasted my time watching all your videos, no mention of the actual process. How are funds transferred!? Hello, sorry for that, but what do you mean? the plugin is a paypal plugin, which means all the funds are going to go to your paypal account, to set it up you can use your paypal email, i think the first video shows how to setup a donation button. I just installed it and will consider purchasing the Pro version if people actually make donations through it. – I’d like to be able to mix the donation types. For instance, 3 buttons as “suggested donations” but also a text box or slider if they prefer to give yet another amount. – On PayPal, there is the option to write a custom “purpose” before confirming the donation, I guess it would be like comments for a donation wall. It would be nice to be have a widget/shortcode to display them. Also, is IPN already (automatically) integrated? To what URL does it send the response? Thanks for taking the time to write your suggestion, i added them to my list. I don´t plan to use that purpose field that Paypal provides but i am doing something a lot better =) (at least i think is better) i am adding a new donation style, “Forms”, so you will be able to crate a custom form with the fields that you want and when you receive a donation you will get an email with all that information, the “Forms” donations uses IPN and, as you can imagine, they were really hard to do (it was like creating a new plugin!!) so i will place them in the “pro” version. After that i am planning to work on a donation wall, this will be part of the free version and off curse the donation wall will be a short code AND a widget =). IPN is integrated, it sends the response to a php page of the plugin, it also support refunds ( so if you give a refund the progress indicator will be updated). Thanks for your support =). well i love the concept. I followed all the instructions. I made campaigns for each girl. I tried button then slider which the slider is the one i liked. but in the widget the title shows on my sidebar bu not the list. and the post pages when i add the smile face to the post it don’t show up on the page. Not sure where I went wrong. Thanks for the great plugin! One question, on my website, when I use the slider, it slowly disappears once I start sliding it back and forth. This happens in a variety of browsers, yet it doesn’t happen when I use the slider on other websites. Weird, the bar disappear with an animation so it should be a plugin or a feature of your theme that hides a div in certain conditions, i’m afraid i don’t know exactly what do that but you can try disabling the plugins one by one and changing the theme and see what is causing this isssue. Hello. Thanks for your interest but i am afraid that they are not supported yet, now that i think about it that is an important feature that i am missing so i will try to add it somehow in the “forms” donation style but i don’t know how log that is going to take. You might want to check this site http://codecanyon.net/ there are a bunch of awesome plugins there. I wish you the best of luck and if you have any question please let me know =). Great plugin, I also got the Pro version. While testing the plugin I noticed that PayPal is asking this “You must add funds to your PayPal account before sending more money.” However, If I test sending money to the same location manually at PayPal site, there is no issue. Is PayPal treating this plugin “not so secure” and throwing extra step? Or am I missing something? Hello! !, first, thanks for purchasing =). As far as i know Paypal doesn’t add any additional restriction on plugins, Paypal even has a page that lets you create a button and what this plugin do is just to format and add more features to that plugin (like displaying the button in different ways or adding tracking to the donations) but for PayPal this button is as good as the buttons they generate. I just checked that issue and it seems more like an issue with Paypal (https://www.paypal-community.com/t5/Adding-and-withdrawing-money/You-must-add-funds-to-your-PayPal-account-before-sending-more/td-p/593133). So i recommend to wait a little bit or contact paypal. I hate to say this but definitely PayPal is doing something to your plugin. I created a button from PayPal page, and it does not give me that error message. Money was being sent to the same destination and from the same source. Maybe because the plugin uses the email address to identify the destination. You might want to check it out more. The Paypal donation buttons also uses the email address to identify the destination. can you send me the code that you created with paypal and the code you created with my plugin? i would like to check them. Ooppss, this site does not allow posting HTML code. I am trying with some delimiters. If it does not work please email me, I will reply with the code. I love your plugin but can I change the currency from dollars to Euros ???? Yes, just open the advanced options and choose your currency =). I am having trouble activating the pro version. I am using wordpress 3.0.5. Will it work with this version. I also installed it on 3.2 and I am having the same issue. When I click the link that indicates if I already have a pro license, nothing happens. Please help. Hello, i already responded your email. Could you check it please and reply me back?. Again, thanks for your support =). Great plugin, I purchased the pro version. I am setting up a new site and I would like to try and fake the progress bar a little bit just to get the ball rolling, makes me look really unpopular with it empty. Can I do this just by editing a few files and if so which one(s)? Hello, you dont have to edit any file, you just need to create new entries through the analytics screen, for more information, check this video: http://www.youtube.com/watch?v=Rt1fe7QC4U4. Thanks for the quick reply. Looking a lot better now. Unfortunetly, the progress bar isn’t working for me. Number is always $0.00 even if a paid and receive a confirmation from paypal. Can you help me? Hello, for the progress bar to work, the donation button and progress indicator should be pointing to the same campaing (video tutorials here: http://rednao.com/tutorials.htm), so, are they pointing to the same campaign? I want to add the donate button to the top nagivation with the rest of the social icons to the right. How would I add the donate button up there? What would I put in the css? Can you help me please? Hello, that highly depends on your theme. You can add a donation button as a widget or as a shortcode. If your theme support the addition of widgets in that top navigation bar you just need to add it. Thanks Edgar, Where do I find the shortcode? Also, is it possible to just have a JPG image that I could just drop into the page? Hello!, it looks centered to me to be honest. You could move it even further by adding negative margin if you want (e.g. margin-left:-10px). I have it configured and it works feat. However when the donors go to PayPal there is a spelling mistake in the “product” line that I would like to correct I can’t figure out where I do this. Can you help? Hello, please check the tutorials here http://rednao.com/tutorials.htm, you have to use your paypal email in the button configuration to link it to your paypal account. Hope this helps. Thank you for this plugin which we use on our site. Hello, i think you only need to write that text instead of “Current Donation”, perhaps i am not understanding your question? Hello, wepay recently announced they are no longer offering the tools of donation or by now buttons, but are going fully API. I was wondering how this may affect your plugin? Unfortunately it will affect the plugin since it is using the donation buttons. So i might end up creating another plugin or an extension to add wepay support using the api. I love this plugin! I bought the Pro Version so I could use a form. The support from Edgar was quick and friendly, and the tutorials were very helpful. I am only moderately competent with WordPress stuff, so if this plugin was so easy for me, it would be easy enough for anyone! I have wordpress responsive website. http://www.oratechsolve.com. I want to create campaign to gather $10,000 for our project. I added number $10,000 in campaign but it is showing as 0. What I have to do to fix this? I use contact support form from smart donation plugin. It goes to go daddy support contact instead to smart donation support contact. Could you please tell me what could be the reason?